First, you mentioned that discussing success is not useful for you and that's really interesting to me. In this interview mainly I want to talk about freedom and related issue. But before that, could you tell me the reason that talking about success is not useful to you? Because some activities are good for society and some are harmful for society. Of course, many are neutral. If person A knows how to aim for success, that may be good or bad for the rest of us. And I didn't set out to be a success. I didn't set out to make a lot of money or become famous. I set out to give software users freedom, which is a goal that deserves to be done. It's a goal that's important in its own right and I just happened to be the person trying to achieve it. And to a certain extent I have succeeded. It didn't make me rich but it's success, to an extent, because at least there is now a large community of people who use and contribute to free software, so in that sense it's a success. But when I look at it I don't ask, am I a success? I ask, do users have freedom? Great to hear that. Can you tell me why you are so in favour of the freedom? Partly it's because I resent being pushed around. I resent anyone giving me orders. Partly because I grew up in the US, where people were taught to think about freedom—or at least were. I don't know if any of the children are taught any of these things any more. Partly because not long before I was born, there was a World War against some horrible dictators and partly because I had the experience of having freedom in my use of computers when I worked at the MIT artificial intelligence lab in the 70s. And so I was sensitised to notice the difference between free software, freedom-respecting software and user-subjugating software. So for ten years or so, my work was done on improving a free operating system, most of the parts of which had been developed at MIT by the group I was part of. So working, improving that system meant taking advantage of freedom all the time, so I came to appreciate freedom. But that's not quite the end. Because the community fell apart in the early 80s and it was no longer possible to have the freedom. So I saw the contrast between living in freedom and losing freedom, and I found non-freedom disgusting. So I decided to do something to bring freedom back. Can you tell me how…? You are now trying to bring freedom back, which conversely means there's no freedom at the moment. Yes. With regard to software. First of all, this is a big question. In regard to software, proprietary software does not respect users' freedom because the program controls the users. If the users aren't free to change a program and do so either individually or in groups cooperating, then the program controls the users. Now, with typical proprietary software there is even a licence that says what users are allowed to do with the program and what they're not allowed to do and it can be as restrictive as the developer chooses to make it. For instance, there is a Microsoft program for managing webpages, websites, and its licence says it can't be used to publish anything that criticises Microsoft. So here, nonfree software takes away your freedom of speech. This is obviously intolerable. If you can't use your copy freely you can't control your computing. You can only do what you're told. But then the second level of control, through the source, through writing the code of the program; if you use a program whose code was written by somebody else and you can't see it or change it then that somebody controls what you do. He could make the program do nasty things to you, and even if you happen to find out, you still can't change it. Finding out is difficult because you don't have the source code. Sometimes you will notice some sign that it's doing a nasty thing. Other times you won't notice. For instance, Windows has spy features which send information about the use of the machine to Microsoft and users can't see that this is happening. It was not easy to find out that these spy features are there, but people found out. They had to be somewhat clever, in some cases, to discover these spy features. And then there is a back door in Windows which allows Microsoft to forcibly install software changes. It doesn't have to ask permission, it can just sneak them in. So this is what I mean when I say a program controls the users. But even if there's no back door to allow the developer to install changes, it's still the case that the program does what the developer chose to make it do, and if you don't like that, you can't change it. So you're stuck with it. So the back door is sort of icing on the cake for his power, because it means that even if he forgot to do something nasty, he can put it in retroactively. Without that kind of back door, he's limited to the nasty things that he thought of in advance. There are many proprietary programs that are widely used, that do surveillance; there are many that are specifically designed to restrict what users could do. Those restrictions which limit what users could do on the data in their machines are known as digital restrictions management or DRM, also sometimes referred to as digital handcuffs. So the point is, using those programs is like being handcuffed because you can't just move your hands around anywhere you like, the program is stopping you. And these are intentional features. Of course, programs also have bugs, and if you don't have the source code you can't fix the bugs. So the users, in order to be free, must have the source code, and they must be able to run their own modified versions of the source code in place of the original. And they have to be free also to distribute their modified versions. Because if you don't have that freedom then you could fix a problem for yourself but you couldn't fix it for anyone else, which means that each individual user would have to fix the problem. It would have to be fixed over and over and over. Also with the freedom to distribute your modified version, the people who don't know how to program can benefit. I understand a bit about freedom for software now. So if I'm using the free program and I make a change in it, which I know how to do, then I could publish my modified version and then you. Perhaps you're not a programmer; you would still be able to get the benefit of the change I make. Not only that, you could pay somebody to change the program for you, or you could join an organisation whose goal is to change a certain program in a certain way, and all the members would put in their money, and that's how they would hire a programmer to change it. So the definition of free software is the four freedoms that are needed for the users to have control of their computing. Freedom zero is the freedom to run the program. Freedom one is the freedom to study the source code and change it so it does your computing as you wish. Freedom two is the freedom to help others, which is the freedom to redistribute exact copies. And freedom three is the freedom to contribute to your community, which is the freedom to distribute copies of your modified versions. So these four freedoms ensure that the users, both individually and collectively, control the program. If the users don't control the program then the program controls the users. That's proprietary software and that is what makes it evil. Sounds similar to Creative Commons—verifying the types of copyrights. Yes. Creative commons publishes various licences. Yes. Do you agree with all those kind of activities on freedom? They don't have a position on that. Creative commons licences grant the users varying amounts of freedom. Two of their licences qualify as free by our criteria. Those are the creative commons attribution licence and the attribution share-alike licence, those. And I think maybe there's also the CC zero licence, which I usually don't think about. But I think those three are all free licences. The other creative commons licences do not go far enough to make the work free. However, I wouldn't say that all published works must be free. I think the published works that must be free are the ones that you use to do practical jobs. So that means software, recipes for cooking—and recipes for cooking are a good examples because, as I'm sure you know, cooks frequently share and modify recipes. And it would be a tremendous outrage to stop them. So in effect, cooks treat recipes as free. But let's look at some more works that are used for practical jobs. Educational works are used for practical jobs; to teach yourself or teach others. Reference works are used for practical jobs; to look up some information. And then there are text fonts, which we use to display or print text so it can be read. These are examples of works of practical use. These are not the only examples. I m sure you can find some more. Anyway, works of practical use are the ones that I believe must be free. However there are other kinds of works. For instance, there are essays of opinion and scientific papers and there are artistic works, and their contributions to society are of a different kind. They don't contribute through helping you do practical jobs. They are useful in other ways. So I draw different conclusions about them. I think the crucial conclusion for those other works is the freedom to non-commercially redistribute exact copies, in other words the freedom to share. I'm interested in what you're doing. You're travelling around the world, like me, and you're contributing to others, not for yourself. And I love that way you live and I respect it so much. So I was just wondering, how you describe yourself? I describe myself as a free software activist. Activists means the ones who change the world? First of all, we haven't changed the whole world, not even in this regard, we've only changed a part of it. As you can see, most computer users are still running proprietary systems such as Windows and Macintosh. And then if they have smartphones, those smartphones are running proprietary software and it typically has malicious features too. We have a long way to go to achieve victory. And the other thing is that what we have achieved, I did not achieve by myself. But I did start this movement. Your activities have lasted for a long time, what would be your advice for being an activist? I was rather lucky, in a sense. I was in a position to do something that would forward my cause just working by myself. As other people showed up who were interested they could join. So it's generally good to look for a way to do things that way, in other words don't set out at first to make a large organisation and then begin to achieve something. Start doing things such that you alone, or a small group of people who support you, can achieve something, and by achieving something you can attract the attention of others who might want to join. In fact, I've read that advice in a book. I don't remember where, because that was a long time ago, but it fit what I had alreasy done. I can't say I thought of this as a general principle, but it did work well in my case. And the other thing is, don't design your activism with the idea that first you will raise a lot of money and then with the money you'll be able to do such-and-such, because on that path you almost never get anywhere. It's so unlikely you will succeed in raising that money that chances are you'll spend all your time trying and failing, and never start doing anything about your cause. So design your plans so that you can start doing things for the cause soon and that way you'll spend your time getting a certain amount done for your cause, which is better than nothing. And of the ones who follow the raise-money-first path, those few that succeed in raising the money will find that their years of focusing on making that money have changed their goals. By the time they have that money they will be used to trying to do everything to get money. Few people have the ability to turn around and start directing their efforts toward something other than getting and keeping a lot of money. Indeed. 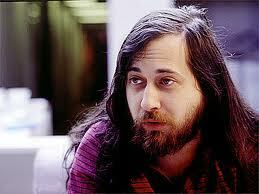 Can you tell me how did you gather great people when you launched the Free Software Foundation? I don't know if I always gathered great people. Some who came to us were good and some were not but I couldn't tell very well in advance, I didn't know how to judge that. But enough of them were good that they've managed to achieve a lot. So did you gather people or did people automatically come to your place? Mostly people had seen what we had already done and found it interesting, and they would either help or, in some cases, come back when the FSF was hiring and we would say we were looking for someone to hire. Maybe we knew them already—who was a good programmer—by their contributing as a volunteer, so we knew if we hired them, they would be good. I see. Thank you so much for your time. As a final question, I want to ask you about what we should do to spread the freedom. The big enemy of freedom is governments taking too much power over society. They do that with two excuses: the excuse is terrorists or child pornographers. But we have to realise that anti-freedom is a bigger danger than either of those. For instance, censoring the internet. We must not accept laws allowing punishment without a fair trial. The US set a horrible example when it started grabbing people from all around the world without a trial. Even now, Obama is continuing pushing military commissions, which are simply trials that don't live up to the standards for trials. They're not fair trials. We know a lot of the prisoners were in Guantanamo because somebody told a malicious rumour about them, and we can't rely on military tribunals to distinguish between real evidence and malicious rumour or the fact that somebody was tortured and eventually said whatever his torturer wanted. Right now, I'm told the Iraqi Government is still committing torture and I was told 30,000 prisoners who are without trial. This is a monster that the US created. Governments around the world keep looking for more power. The problem is, they have too much already. That's true. How can we get the power back from the governments? I do know something about how we can teach people the need for this. Governments get their power by focusing people's attention on some secondary problem. For instance, in the US, how did the Government get its power to torture and imprison people and even just bomb them? The US practises targeted killing. There's a list of people who are marked for death and the US Government will drop bombs on them rather than try to arrest them. Now, how did all this get started? It's because the US focused people's attention on the secondary danger of terrorists carrying out the September 11th attacks in the US. Now, Bush didn't want an investigation of those attacks. Eventually he was forced to allow an investigation, but he weakened it and corrupted the investigators, so we can't trust the results. There has never been a proper investigation of how those attacks were carried out and who was responsible. So maybe it was planned by a bunch of terrorists as the Government says, or maybe Cheney was involved, as some other people say. Without a real investigation, we'll never know. But given that excuse, George Bush went on to demonstrate that tyranny is worse than terrorism, because those terrorist attacks killed under 3,000 people, and they were used as the excuse for the conquest of Iraq, in which 4500 or so Americans were killed. So even if we only consider who's more dangerous to Americans, the answer is Bush. And that ignored the million or so Iraqis that Bush killed and that Bush prevented us from counting. But by preventing them from being accurately counted, Bush made it possible for low estimates such as that of Iraq Body Count to seem plausible. I read recently some journalists went to look for oil buried just below the beach in Florida, and some sort of Federal agents ordered them not to, because they don't want news that the oil is there. They're hoping to cover up the effects so as to get it out of people's minds. And whether they're doing that for BP or for Obama or both, it's offensive to try to stop the public from knowing. Do you believe that the internet has the possibility to change this phenomenon? That's a different question. The internet is useful for various things like sharing valuable information. But it's also useful for surveillance. So the internet can be used for good things and bad things. So how do we make sure that we are free to share? How do we limit the surveillance? It's a matter of stopping the Government from doing things that are unjust. Richard Stallman is a software freedom activist and the president of the Free Software Foundation. Copyright © 2010, 2013, 2019 Free Software Foundation, Inc.